I have tried to research here on WWM, forums, my books, etc. to find this answer but have really only found differing opinions on this topic. 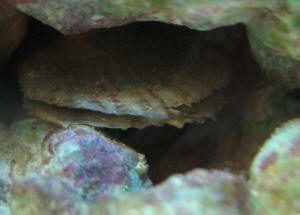 My question is regarding the use of a combination of live rock and live sand to eventually "seed" some non-live sand and, likely to a lesser degree, the dry rock in a new reef aquarium. 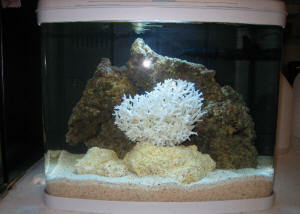 This will be my first reef aquarium and my only previous salt water tank was a FOWLR about 10 years ago. So, I can't base much on experience here and have to go by what I find while researching. I know it is generally accepted that live sand can be used to eventually seed non-live sand and have read that, to some degree, this can happen with dry rock used with live rock. However, it seems that the dry rock will never have comparable biodiversity as high-quality live rock, or many of its benefits. I am pretty comfortable using live sand to seed the non-live sand, but wanted to see what the ever-so-informative folks at WWM thought about using a mix of live and dry rock, like Marco rock? And, if so, what percentage would you recommend as a minimum? I have Anthony and Bob's Reef Invertebrates book and they seem to think this shouldn't be an area to skimp on as the benefits of using all live rock is worth the extra cost. But, with my setup I wanted to see if you thought this might be feasible. I also like the idea of being able to saw, chisel, and otherwise shape some of the dry rock and take as long as I would like to come up with something a little different. , 4 Tunze Stream 6101's with 7095 multicontroller, lighting is a Coralife 3 x 250w metal halide with a few LED's for dusk/dawn, ATO and water changes will all be with RO/DI water. Other gear; Ca reactor, chiller and similar will be added soon, if needed. I also have planned on having a 5-6" sand bed in the main display as I know I would like a Pearly Jawfish. I'm shooting for a peaceful community with wrasses from the Cirrhilabrus family as the centerpiece. Do you think it I would be reasonable to use a combination of live and dry rock and live sand and non-live sand? I am assuming that with a tank this size that the live rock (50-60% or something around 80 lbs) would still be able to cycle the tank appropriately, especially if taken slow? Would the other benefits, such as biological filtration and providing plentiful food items for some inhabitants, make this unwise? Several reef aquarists in my local reef club have used dry rock entirely. Although it eventually gets a nice cover of coralline algae and they have successful reef tanks, I know they are missing the many benefits of live rock. But, I thought a mixture is something that might be considered as reasonable. Thank you so much for any information. WWM is a wonderful resource and greatly appreciated, especially by newbies like myself who want to do things right and not make (many) mistakes. Hello crew/ Mr. Fenner thanks for answering my earlier question. I have another one if you don't mind. I'm in the process of cycling a 90g marine tank with plenty of live rock, it's been cycling for 3 weeks, unfortunately I didn't test any parameter during the first 2 weeks (letting nature run its course). During the 3rd week I tested a few times but the result boggled me. 0 ammonia 0 nitrite 0 nitrate 0,3 phosphate ca, mg, and Alk are good. If the tank is cycled, why I am not getting any rise in nitrates? Or is it possible that a cycle never started? Additional info: I have plenty of life (hitchhikers from LR as in 4-5 snails, and even a starfish) in the tank, plenty of copepods, no diatom bloom, plenty of stringy (?) algae. I do run an oversized skimmer and a biopellet reactor with 500ml NP biopellet. I started the cycle using biodigest bacteria starter and threw in a frozen shrimp just to make sure. Do I do any water changes or any maintenance while my water cycles? <You're fine with what you are doing now, but I'd take the shrimp out and replace with a hardy fish such as a Yellow Tail Damsel. The live rock will establish of the nitrogen cycle. Do read here and related items found in the header. Thanks for answering back so fast (salty dog) wouldn't the damsel die......I don't want to put the fish trough that.....is there any other way I can do besides putting the fish trough that. I realize now I should have tested sooner to see if I had a spike in ammonia. Does this mean my tank has cycled or because I used established rock/sand I may not have a cycle? however, if the tank was not cycled wouldn't that mean I would see ammonia or nitrite vs. nitrate since I wouldn't yet have the beneficial bacteria to break these down into nitrate? but I used all new water from the LFS (RO water). I also have a normal alkalinity level but my pH is 7.8. Will that be too low for a reef? I set up my tank 19 days ago with live rock and have not seen a peak in ammonia yet, I have been doing water tests every 2 to 3 days and feeding the system with fish food, I am getting a slight nitrate reading of between 5 and 10 depending how your eye sees the colours. Life has started to appear out of the live rock and growing on it, amongst other things a couple of little star fish and a brittle star and a nasty bristle worm that I noticed when I put some food in which I removed with my tongs. Now my question is, have I missed the ammonia, isn't it coming or has it gone, I was going to add part of my clean up crew in a week or so. What I want to know is how safe do I know it is. <You didn't miss the ammonia peak providing your live rock was cured, it was never there. The surface of the live rock serves as a platform for the nitrifying bacteria (Nitrosomas and Nitrobacter) which convert the ammonia produced in your tank into nitrites and then nitrates, and is likely why you are now getting a nitrate reading. The large amount of small "cells" in live rock also creates the ideal oxygen free place for anaerobic bacteria to grow. Anaerobic bacteria converts the nitrates in the tank into nitrogen gas which is eventually discharged into the atmosphere. It is best to always add fish slowly thus giving the nitrifying bacteria a chance to adjust their population to process the increased load on the system. <Do read here for more info. I have had my 40gal FOWLR tank up and running for 12 days now, I have 20lb of live sand and 28lb of Cured Rock. I have tested it every day with the same results ph 8.2 - 8.4 Ammonia, Nitrite and Nitrate all 0.0. Can you tell me if this tank will ever spike or is it because I have used Cured Live Rock it won't. If it needs to, how can I help it along the way. Just after some advice if I may. I am in the process of building a new marine store that will be opening for business at the start of 2010. I would like to get your thoughts on cycling our livestock systems so they will be ready for business in the shortest possible time. The systems them selves are about 700L each, and I plan on adding about 10kg of fresh live rock into each as well as some live sand from my established reef at home. Ideally I'd like to be able to use these tanks about 2 weeks after I fill them, but obviously I am not going to be putting thousands of dollars of livestock into toxic systems. Bob, please help me figure out where I am at this point. I started with about 15 pounds of live rock in my 10 gallon QT tank. After the first night the ammonia levels were through the roof, I changed about 25% of the water and let it sit there for another week. At that point ammonia, nitrite, nitrate levels had all gone back to zero. When my larger tank arrived I set it up and moved the water from the small tank into the big tank to make sure the bacteria was moved. I now have about 75 pounds of live rock and 50 pounds of live sand in a 120 gallon tank. No fish just a few inverts. Every day the ammonia, nitrite, and nitrate levels are zero. The ammonia levels have never went up since I got the larger tank. I am unsure if using the water and rock from the smaller tank has helped with the cycle of if there is not enough ammonia being produced or if the cycle if finished. Should I expect another ammonia spike when I add the first fish? Last year my tank with 30kg of live rock in it crashed .When I removed it from tank I accidentally placed it in fresh water so I now know the rock is dead. with live rock will start when I add corals and stuff. I am now confused cause other stores say to cycle tank with about a 3rd of cured live rock. Which is correct please help don't want to spend money that I don't have too thanks . Cycling with liverock I will try to be brief. <No problem> I am brand new to this stuff, at least to marine. I have started the set up process with used tank and accessories from an individual who upgraded to larger. I have set up a plenum with "live" sand, at least that is what the bags said. About 60 lbs of live sand, 20 lbs of aragonite, and 20 or so of "substrate/ gravel". Using the equipment below, I let the sand settle and run for two days. Now the fella I bought the equipment from said I needed to get something in the water otherwise I would "loose the sand". On his suggestion I ran out and got a half dozen damsels and a dozen hermits. 72 hrs later still all tests are quite good and livestock are hanging in. Everything I have read suggest I should be cycling with LR right now. My question is this, is it ok to put some in (100 lbs), it is supposed to be fully cured Fiji. Should I expect a large enough spike to kill the little livestock I currently have? <Any ammonia or nitrite will stress the livestock. It is preferred to add liverock and cycle the tank with this. If you decide to keep the livestock use water changes when necessary to control the ammonia and nitrite. Yes, you can add the rock now. Hope this helps, Don> What I have; 100 gal tank two 14000 k MH : on for about four hours/ day four compact actinic : on for 12 hours emperor power filter/ BioWheel three power heads Berlin HO skimmer I will be converting to sump after I gather up all the remaining items.